Photo credit: Visual House-Nelson Byrd Woltz. The concept art for “Vessel” looks like a set piece from a future sci-fi film. “Vessel” is a massive honey-comb shape of openings and staircases. It’s going to be a public art installation in New York City, planned for the Hudson Yards mixed-use development. British Designer Thomas Heatherwick intends the massive piece to serve as a sort of anchor point for the northern end of the High Line, the long collection of elevated train-tracks-turned-art-walks that winds thorough the boroughs. 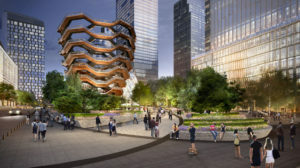 When finished, “Vessel” will be a 15-story-tall climbing structure of crossing staircases that wind in ever-widening angular spirals up higher than the nearest buildings. Warmly colored in bronze and cement, it will stand in the center of a 5-acre public plaza surrounded by beautiful landscaping. It will feature more than 2,500 steps, and 80 landings will serve as vantage points. Heatherwick was inspired by Indian step wells which are intricately detailed deep ponds or quarry pools reached by magnificent steps. An elevator on a curved track will sweep up one side of “Vessel,” making sure that everyone will be able to take advantage of the views. But Heatherwick says the design is also meant to speak to New Yorker’s love of walking everywhere. Private developer Related Companies is bankrolling the installation, which is currently under construction in pieces in Monfalcone, Italy. It will be assembled on site in Manhattan in 2017, and open in 2018. The project is already at nearly double its original budget, but Stephen Ross, founder of Related Companies, doesn’t begrudge it. He’s excited by the design. And it certainly will be. If you recognize Heatherwick’s name, he also designed the 2012 London Olympics torch. Additionally, Heatherwick designed Google’s new office campus in Mountain View, California, and several parks around New York City.